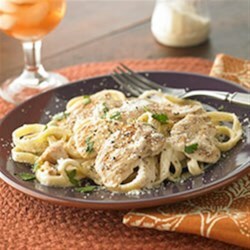 "Creamy sauce, succulent chicken, perfectly al dente pasta, a sprinkle of fresh herbs . . . all that's missing is the waiter and the check." Meanwhile, heat large nonstick skillet sprayed with cooking spray on medium-high heat. Add chicken; cook 5 to 7 min. or until chicken is done, stirring occasionally. Remove from skillet. Mix broth and flour in same skillet. Stir in Neufchatel, 2 Tbsp. Parmesan, garlic powder and pepper; cook 2 min. or until mixture boils and thickens, stirring constantly with whisk. Stir in chicken. Drain pasta; place in large bowl. Add chicken mixture; toss to coat. Sprinkle with remaining Parmesan. Special Extra: Sprinkle with 2 Tbsp. chopped fresh parsley just before serving. Substitute: Prepare as directed, using whole wheat fettuccine. Variation: Stir in 2 cups chopped cooked broccoli before serving. Good, easy, quick recipe for working people! Family said I could make it again which is always a plus! Well do it again! LoVed it! Made it more a "Cajun Chicken Fettuccine Alfredo" tho. DELICIOUS! !